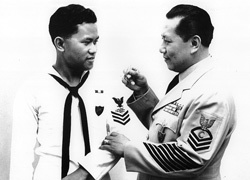 Rudy Pulido was born in the Philippines during the Depression years and experienced the hardships of life during World War II, which formed and tempered his character and prepared him for future life in the military. He emigrated to the United States to join his father who was serving in the U.S. Navy as the Chief Stewart to the Secretary of the Navy in the Pentagon during the early 1950s. Rudy graduated from Anacostia High School in Washington D.C. in June 1953. He then enlisted in the U.S. Navy in August 1953 as a Stewart Recruit (E-1) during the Korean War. 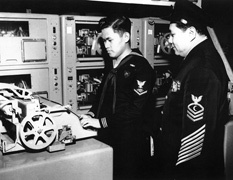 Rudy graduated 2nd in his class at the U.S. Navy Radioman School, Bainbridge, Maryland in June 1954. Rudy was assigned to duty station at the U.S. Navy Base (Communications Station) Charleston, South Carolina, during which time he obtained his American citizenship papers and became a full-fledged American citizen. He then volunteered to military duty to serve overseas at NATO (North Atlantic Treaty Organization) Headquarters, Southern Europe, Naples, Italy. Rudy rose rapidly to the rank of RM1 (Radioman First Class E-6) in the shortest possible time of 3 years and 10 months. Rudy served a total of 8 years obligated service (08/1953-08/1961) in the U.S. Navy. He then used his Educational G.I. Bill Benefits to pursue and earn his BSCE (bachelors of science degree in Civil Engineering) from the University of Maryland at College Park in January 1962. After graduating from the University of Maryland, Rudy married his college sweetheart, Ester Lagmay, and both headed west to California. Rudy accepted a position with the California Division of Highways (now called CALTRANS), where he was involved in several projects such as: I-405 San Diego Freeway through Mullholland; I-10 Santa Monica Freeway; I-105 Freeway; and most especially the I-605/91 Freeway Interchange, which is close to Cerritos. In addition, Rudy also accepted the position of Senior Civil Engineer at Nevada Nuclear Test Site in Mercury, Nevada. Besides his engineering career, Rudy was also heavily involved with his own Real Estate business here in California and in Las Vegas, Nevada. He was the first Filipino-American awarded to own the Red Carpet Realtors Franchise in Anaheim, California. Rudy and Ester have been happily married for 45 years and blessed with four wonderful and talented children. Two received their bachelors degrees from the University of California, Los Angeles and the other two graduated from California State University, Long Beach. Their son Mark is serving his second term on the ABC Unified School District Board of Education. Their son Rod, a film director, writer and producer, co-produced with Rudy the feature length film "The Flip Side," which won critical acclaim at the prestigious Sundance Film Festival in Park City, Utah in 2001. Additionally, as an active member of our community, Rudy has been a past president of several organizations such as the Philippine Technical and Professional Society; the Philippine Society of South East Los Angeles; and the Southern California Phil-U.S. Veterans Association. In addition, Rudy is the immediate past Post Commander of Veterans of Foreign Wars (VFW) Post 1846 Cerritos/Artesia, serving in that capacity from 2004 to 2006. VFW Post 1846 has over 100 members and was organized and chartered by the National Headquarters on July 15, 1983. During Rudy's command, VFW Post 1846 collaborated with the Fine Arts and Historical Commission and the Cerritos City Council to erect a stunning memorial dedicated to all veterans who served in any branch of the Armed Forces of the United States. The Post is also involved in the processing of Cerritos veterans applications for the City of Cerritos Veterans Project web site.